It’s safe to say a sailboat is only as good as its sails when you consider that capturing the wind’s energy is the premise behind what sailors do to propel their boats in a forward direction. A good captain will trim those said sails to be as efficient as possible and the proper heading will help with overall performance, but the sail is the driving force of the boat. The keel is a fixed appendage on the bottom of the hull that provides the sideways resistance needed to counter the force of the wind on the sails. 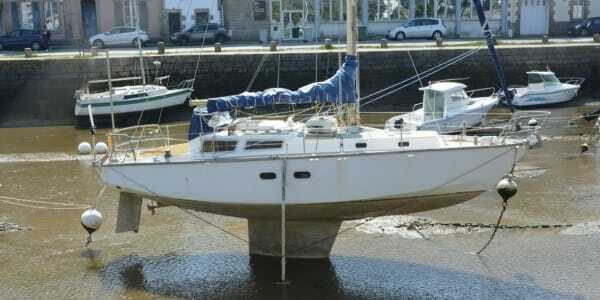 The keel also carries ballast, usually iron or lead, the weight of which counteracts the force of the wind that causes a sailboat to heel, or lean over. On a modern boat, the keel is shaped in the form of an airfoil wing to generate lift, which helps it sail closer to the wind. 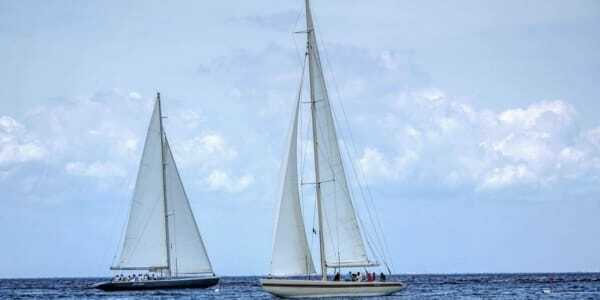 A keelboat is generally larger than 20 feet and can be as large as a megayacht at 200 feet. A boat smaller than 20 feet without a keel is referred to as a dinghy. A dinghy has neither a keel nor a ballast. To resist sideways movement it has a centerboard or a daggerboard that can be lowered or raised as needed. Unlike a dinghy, a keelboat won’t capsize. In a strong wind, it may heel a long way over, but the ballast in its keel is designed to keep it from capsizing. In a dinghy, to resist heeling you would use live ballast – the crew sitting out on the edge of the boat to counter the effect of the wind. Smaller keelboats are often used in sailing instruction as these boats are small and responsive enough to provide the new sailor with the feel and feedback important when learning, but big and stable enough to carry an instructor and students in comfort. Let’s go straight for the cliches and talk about the Conch Republic and a salty life and toss in flip-flops while you are at it. In a world away from everywhere the Florida Keys stands out as an outpost for the rest of us. The Florida Keys calls to people who would rather disregard responsibility and embrace the sensibility of not being sensible. In other words, if you fantasize about boat life or you just want to spend time near the water, the Keys might be calling you. 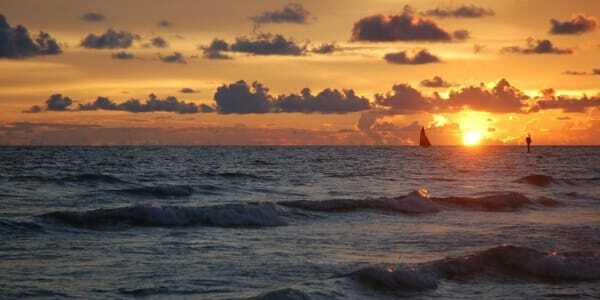 If you want to learn how to sail there are quite a few places in the Florida Keys where ASA courses are taught and where you can combine a getaway with enhancing your sailing education. January is a fresh start, and after a year-long rollercoaster of environmental news, I am feeling hopeful about what’s to come. 2018 was a year of awareness, and while it was painful to learn about the state of our oceans, we now have the power to fix it. 2019 is not only about becoming better sailors; it’s also about becoming better stewards of the ocean. 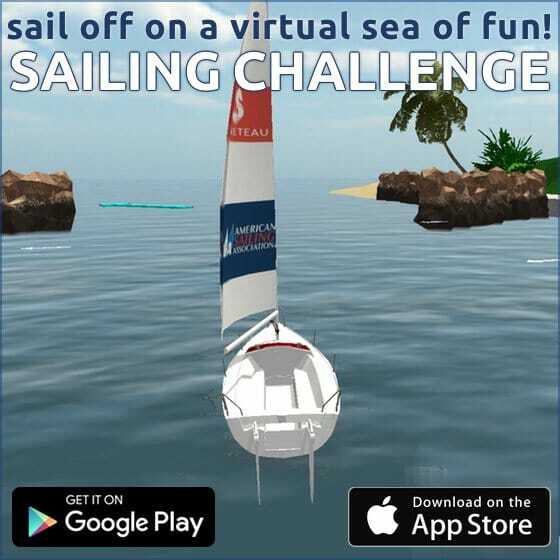 The More You Know, the More Fun Sailing Is! A wise man or woman once said, knowledge is power. 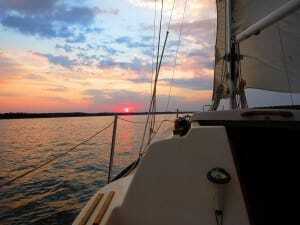 Nowhere is this truer than in sailing, where the more you learn, the more worlds of sailing fun are opened up to you. Like most things in life, the key to success is a good education. Courses from an ASA sailing school are designed to be thorough and enjoyable, and to leave you feeling confident on the boat. Each level expands your comfort zone, beginning with basic boat handling and continuing with coastal cruising and eventually offshore, blue-water sailing! How far you go depends on your goals and dreams as a sailor. Often the biggest obstacle a new sailor has to overcome is not the weather or the waves, but the feeling of being overwhelmed and not sure of themselves. The more training you have, and the more time you spend on the water, the more your confidence will grow. Karen told me that getting a quality sailing education “completely changed [her] attitude about life.” She has plans to continue taking ASA courses and is only having more fun as she learns. Stories like these are the reason we do what we do. One of the best things about these courses is that they can be fantastic sailing adventures in themselves. Many of our schools are located in, or teach classes in, the Caribbean and other exotic locales. That means you could combine a wonderful tropical vacation with a chance to make huge strides in your sailing skills! Learn to sail near you, or look at our list of schools outside the U.S. to find out more. If you want to learn to sail the right way, and have a great time doing it, ASA courses are for you. 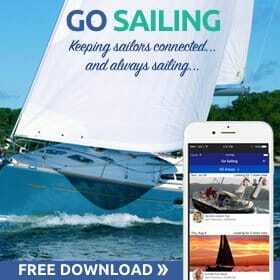 You can even get started online, with our instructive and fun e-course, Your First Sail. We can’t wait to see you out there on the water! 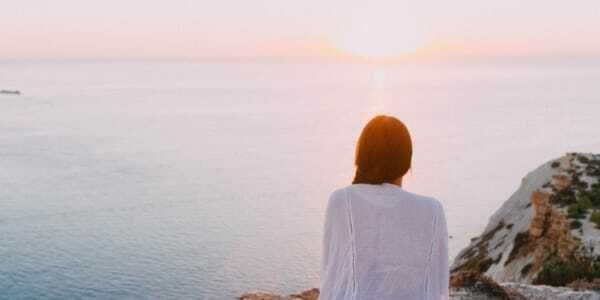 Stepping aboard a sailboat for the first time takes courage. The new sailor is entering a floating world where there are new rules, and even, in some cases, a new language. What happens when someone asks you to ease the main sheet, or calls out “helms-a-lee?” Well, you don’t have to be unprepared when that moment comes! 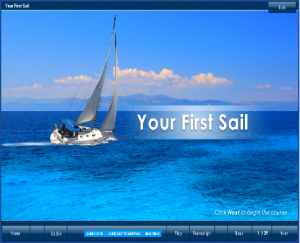 Before you hit the water, you can begin to learn to sail online. 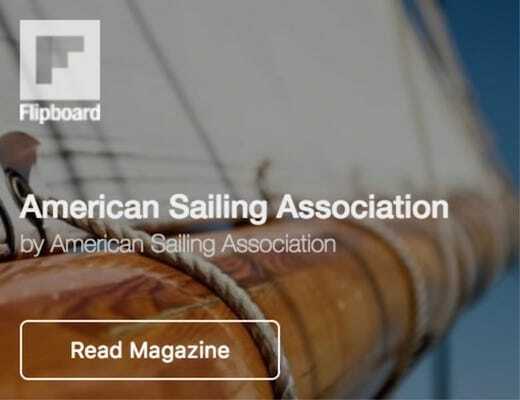 The American Sailing Association is taking its dedication to quality sailing education to a new level, launching its eLearning system and the brand new course, Your First Sail. If any one of the following describes you, this course is for you! I have never been sailing. I’ve been sailing a couple of times as someone’s guest, but I couldn’t tell you the difference between a close tack and a broad reach. I’m not interested in taking a sailing class at this time, but I would like to know enough to be helpful on a sailboat. I’ve enrolled in a basic sailing class, but I’d like to get a solid head start before my first on-the-water lesson. 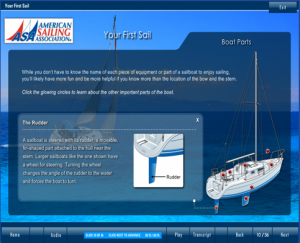 After completing this course, you’ll understand how a sailboat works, the common commands used to steer one and some basic sailing terminology. You’ll not only get the most out of your time on the water, but also be able to actively participate in the magic of sailing! 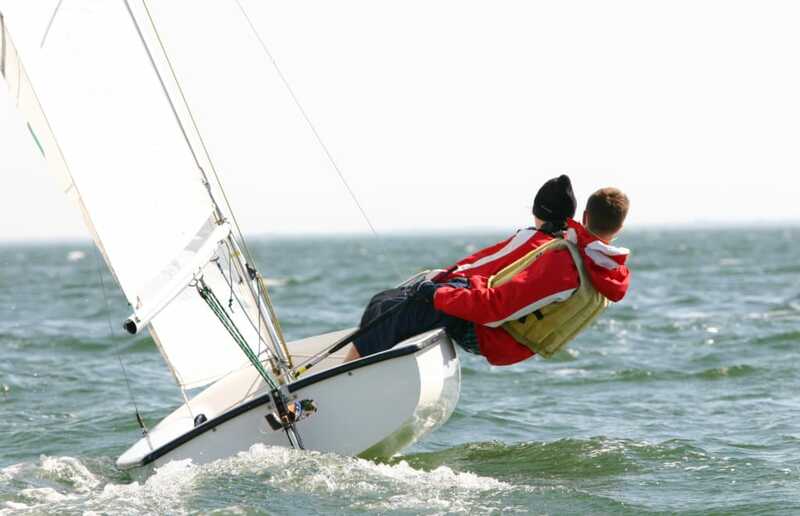 The course is a primer for ASA 101 (Basic Keelboat Sailing), covering topics such as the parts of a boat, wind direction, points of sail, and more. It even addresses what to wear and how to board the boat! Despite its thoroughness, this self-paced course only takes around 30-45 minutes to complete, and is full of interactive diagrams, videos, and pictures to keep the learning fun. “It was extremely informative and I really enjoyed it. I was very impressed with the eCourse; every detail flowed together smoothly. I now feel that the next time I go out with friends sailing I can participate and help now that I know the basics. I learned a great deal in a relatively short time, for a basic course I feel it was GREAT!! Thank you for the opportunity to further my boating education and I look forward to sailing with my friends!” -T.W. So don’t let yourself or anyone you know miss out on a lifetime of enjoyment in the sport of sailing. Check out Your First Sail, and when you take that first courageous step onto a boat, you’ll be doing it with confidence. Click here to get started!